Facebook is now testing AR-based ads in the news feed and Messenger app for its users in the US. 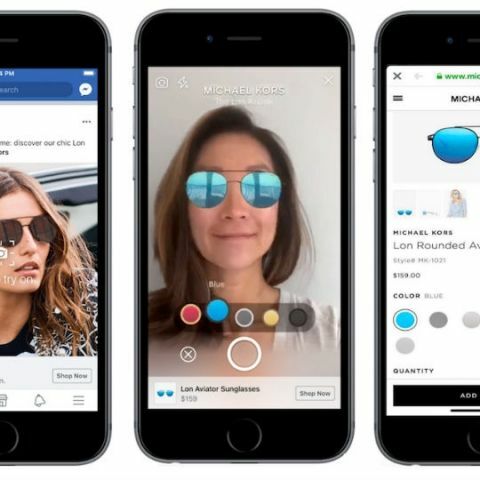 As per Facebook, AR ads were first tested by Michael Kors in the News Feed. Some other brands like Sephora, Pottery Barn, NYX Professional Makeup, Bobbi Brown, Wayfair and King will also soon run their respective AR ads on the platform. TechCrunch reports that as an example, Vice President of product marketing for Facebook’s global marketing solutions, Ty Ahmad-Taylor, showed off ads that superimposed his face into Candy Crush gameplay footage. The company also showed how one could try out a pair of Michael Kors sunglasses, but the same can be used for an array of other products. The new AR-enabled ads will display a ‘Tap to try it on’ option and tapping on it will enable the AR functionality. “People traditionally have to go into stores to do this,” said Ahmad-Taylor. “People still really love that experience, but they would like to try it at home” — so this ‘bridges the gap’.” The company will also release a new toolkit for making AR features, which will be available for developers next week. The new Video Creation Kit is said to allow advertisers to incorporate existing images into templates for mobile video ads. Even though the new feature is restricted to users in the US, the company is expected to test it in other regions as well.